After quake and tsunami in northern Japan area. Friday afternoon, I heard the news about great earthquake measuring 8.9 Richter hit Japan. There were also threat of tsunami as high about 10 meters, on the northern part of Japan area. Sendai is the worst place that hit by the disaster. I immediately searched for news about some friends who were still there. Alhamdulillah, thank God, a few friends who I contacted through the walls of social networking site turned out to respond well to the questions that I typed on their facebook wall. They notified that their condition was quite fine. They managed to evacuate even though the electricity was off. There is also one or two people who I met virtually on their blog. Tanya, a blogger friend of mine even still writes her blog regularly (luckily, electricity and Internet connection around her place was not shut off), and dozens of comments on his blog entry, shows support and prayers. On Saturday, I monitor the news from television and the Internet almost the whole day, trying to find out the latest news from Japan. News quoted on an online newspaper, Republika, said that the death toll has reached the number of 1000 people, and apparently still will continue to grow, since there are many victims who are in ruins and rubble of buildings affected by earthquake and tsunami. Another news that makes me concern and worry, is the threat of explosion of a nuclear reactor in Fukushima area. One of the reactor coolant damaged by the quake. Residents in a radius of 10 km from the site had been urged to evacuate themselves to a further distant to avoid the threat of nuclear radiation. I got the news from various media stated that there was explosion of a nuclear reactor. Related news that I could come up through internet access, it makes me worried. 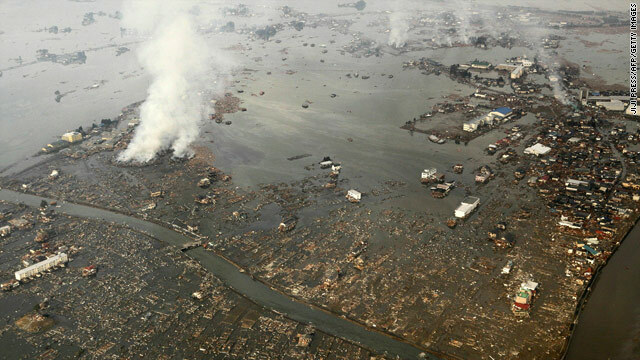 Clearly, my prayers and prayers of us all, is Japan to recover soon from suffering caused by this great disaster. Hopefully our friends and family there will be just fine, and can be reunited with family in the best condition. Amiin. This entry was posted in Global Action and tagged disaster, earthquake, internet, Japan, nature, postaweek2011, prayer, sympathy, tsunami. Bookmark the permalink. let’s pray and give donation to people in Japan and participate on making 110311 crane origami.